It’s 6:30 a.m. in the south end zone at Ben Hill Griffin Stadium, yet the weight room is bustling with workout groups from the football, softball and soccer teams. As the athletes wrap up their sessions, for many there is now a mandatory stop they make before exiting the facility. 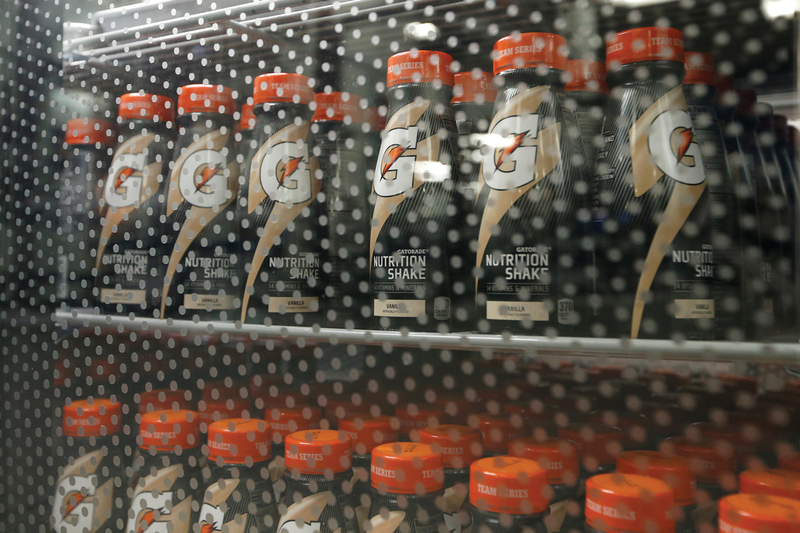 Belly up, folks, to the Gatorade Fuel Bar. 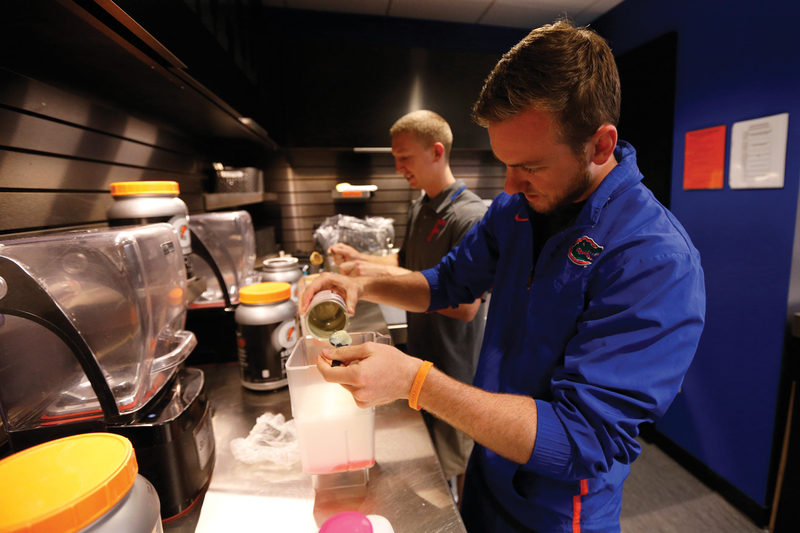 What was once a simple countertop area with some refrigerators has been converted into a full-service nutritional refueling station that UF athletes routinely visit post-workout as part of their training plan, whether on a weight-gain, maintain or lean-out schedule. 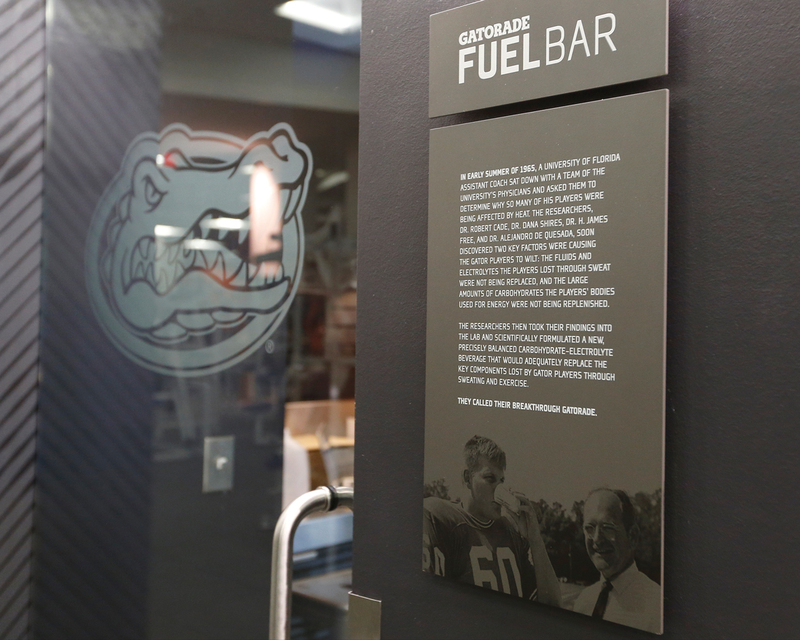 Gatorade-contracted programs began installing the bars last year. Perhaps it was only fitting that this state-of-the-art model showed up in time to celebrate Gatorade’s 50th birthday at the very place the sports drink was invented by Dr. Robert Cade in 1965. A pictorial timeline of Gatorade’s history is part of the slick graphics package that decorates the bar area — under the heading, “Born In the Lab” — that includes a 12-foot food prep and workspace counter, under-counter pass-through visi-coolers, blender stations, cabinet and organizational system, plus an iPad affixed to the wall so workers can have an athlete’s nutritional specifications at their fingertips. 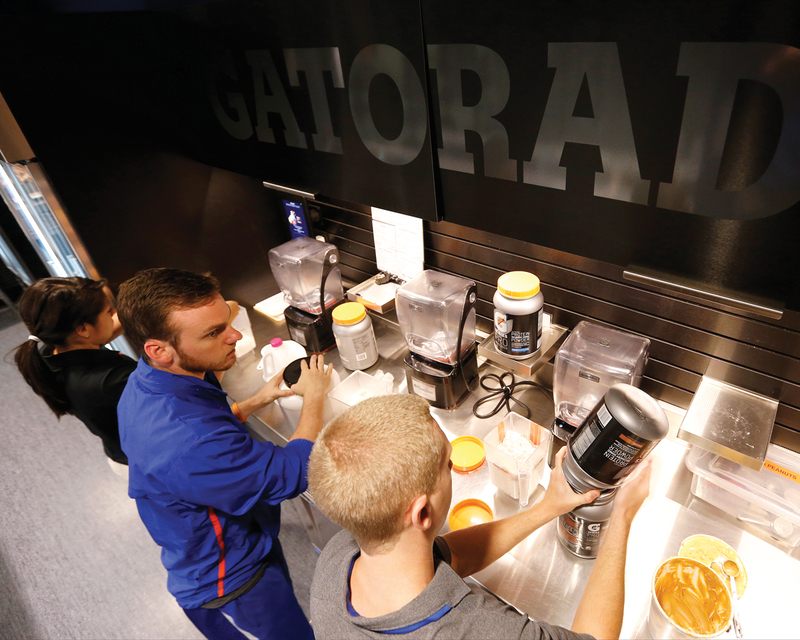 The UAA’s new director of sports nutrition, Stephanie Wilson, oversees the Gatorade Bar and its operation. 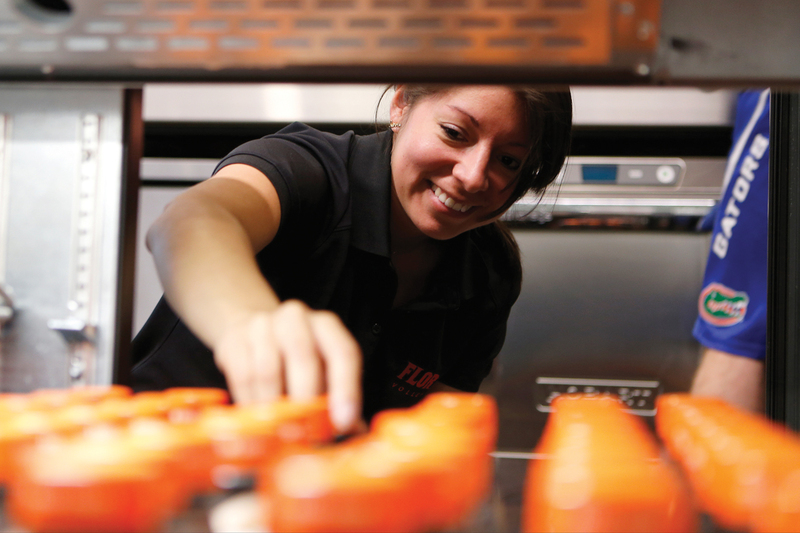 A staff of interns handles the day-to-day workings of the station, making sure the chocolate, vanilla, chocolate-peanut butter or strawberry-banana shakes are prepared, stocked and made to specifications, with calculations based on weight and lean muscle mass. The feedback from the athletes has been all thumbs up. And depending on the time, sometimes the bar is stacked two and three rows deep, not unlike one of the hotspots in Midtown across University Avenue. Nope. Just belly up and fuel up.